Some months have passed since the last big update, I hope you will enjoy all the new WooCommerce features of this release. 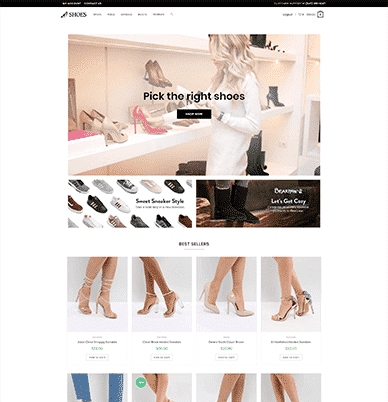 The goal of this update is to increase conversion of your shop and having a beautiful and professional design. You can see that the cart icon style is completely different than the cart icon from the navigation. It’s done this way, because some options are complicated to add in the shortcode, so I created an independent style to make everything to work smoothly. No need to use a plugin for that anymore, I added a new setting to activate/deactivate a Quick View button for the archived products. You can now display your cart on mobile too! The setting is enabled by default but you can of course disable it. A new setting is added to display your cart when a product is added to it. This new setting can help to increase conversion. 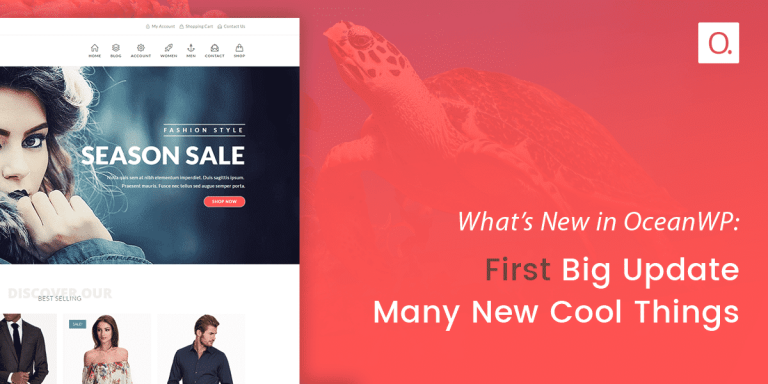 Do you want to display your shop page in full width but still have a sidebar? Now it is possible with this new feature. You can see a new sidebar in Appearance > Widgets, you just need to add the widget you want in it. You can now add Ajax to your single product pages too. 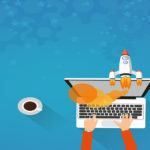 Your customers can buy more quickly and most importantly, the Woo Popup extension will work when Ajax is activated, so you will be able to catch your visitors when they click the button to buy your product. If you prefer to display the thumbnails and tabs vertically, it is possible, just select the vertical layout in the customizer. You will see left and right buttons next to your title to navigate between your products. A floating bar is displayed when you scroll to the tabs area to always have the Add To Cart button which increase conversions because, your visitors don’t need to scroll up to buy your product. Two new settings are added for the sale badge, you can display a percentage instead Sale and you can display the badge in a circle instead of a square. To convert a visitor into a customer, it’s important that he’s not distracted when he checks his cart and when he pays. 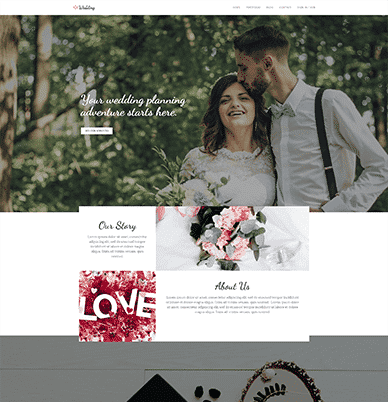 That’s why I’ve added a new option called Distraction Free to allow you to display only the logo of your site in the header and the footer bottom. A multi-step checkout can dramatically reduce the percentage of users who abandon the cart and so increase your sales. Your customers will be able to purchase your product(s) in a few steps. 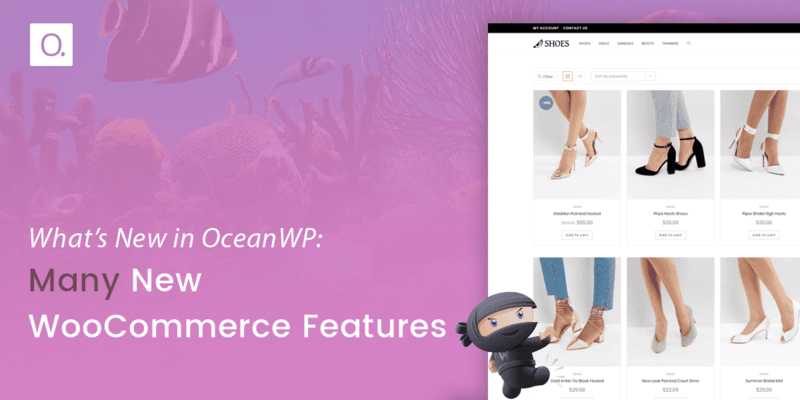 Two new pro demos haves been added in the Ocean Pro Demos extension, a Wedding demo and a new eCommerce demo called Shoes to show you many of the new WooCommerce features. A new setting called Content After Header has been added to allow you to add absolutely anything you want just after the navigation. This setting only work for the Minimal and Transparent header styles. A new option to disable the cart icon from the menu only on desktop is added, so you will be able to use the shortcode and still have the cart icon on mobile. Now the mini cart is displayed on the cart icon when you hover rather than when you click. A better default styling for the mini cart and the possibility to select between two styles, Compact and Spacious. A better styling and position for the wishlist button on the product archives and the single product pages. A better styling for the WooCommerce category and filter widgets. Tell me in the comments what you think about this new big update. Ok, now I’m officialy in love with OceanWP. And this is not because V’Day was just yesterday but for the fact that you trully appreciate your work and your user. Great, great work here, these updates are beyond any words. Is it only to me?? Hi, maybe a cache issue? You can see on the new eCommerce demo Shoes that everything work perfectly on Firefox. Oh, you are absolutely right! Cache clean and everything working fine. Really good work! Thank you. Nice… OceanWp is best theme. The only thing I do not find good on the theme is the shortcodes. As they begin with oceanwp (theme name), some curious clients can search and discover the theme used by my agency, even using whitelabel theme resources, and other details in my admin panel. For the shortcodes, I need to add oceanwp to prevent any conflicts with plugins. Rightclick and view sourcecode and you will find the name of the theme in 95% of all wp-sites. I don’t understand the problem. I’m in love with Oceanwp and i like the new features of this Big update. As i allready wrote to you in the many support tickets i open, if every support developper could be like you, the web would be a better ‘place’. i hope OceaWP and you go even further with plenty of sucess! Wow wow wow wow wow!!! I bought OceanWP a few week and I’m really digging it! Thank you for all your hard work!!! 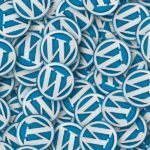 Ces nouvelles fonctionnalités vont me motiver à refaire ma boutique en ligne de traductions françaises de thèmes et extensions WordPress avec WooCommerce. Wow! I am really loving the OceanWP Theme and the pro plugins. Thank you for all the hard work you do. Great work Nicolas, very impressed with the improved features! I’m just an amateur website builder, but OceanWP and Elementor made it a pretty simple process. Thank you! 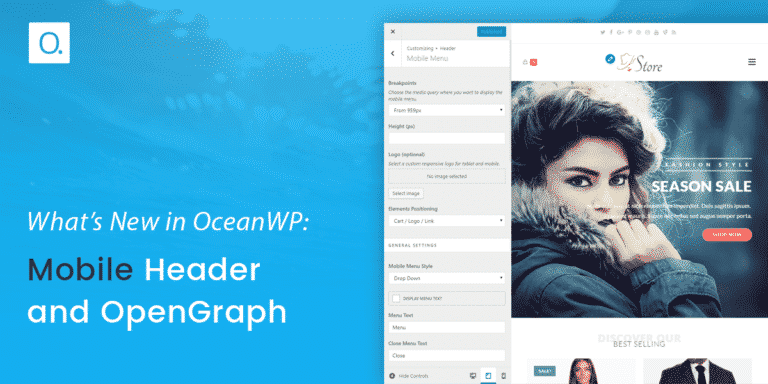 Oceanwp is the best wordpress theme. again I see you have fixed the sticky header resize issue on the new demos. can you show us the fix? For the sticky header, yes, I have fixed the issue when you resize or you change orientation on tablet. Surely the most complete WP theme around ? Excellent work! All your theme are awesome! Keep it up!!! And he does it again! Wow! Nicolas, this theme is THE best theme hands down! And your extensions add miles and miles of extra functionality instead of just being bells, whistles and fluff. Anyone who hasn’t bought the extensions bundle is REALLY doing themselves a disservice. 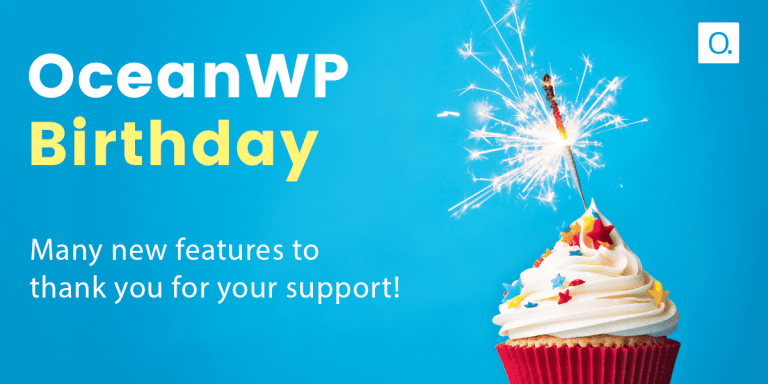 Where I can, I have been recommending OceanWP to other bloggers. For a free theme it has so many customization options. Really appreciate all your hard work, Nicolas! Wish I would have used OceanWP from day 1 of my blog. Every other free theme I tried had so many limitations. Impressive! Can’t wait to test it. Keep up the good work. Hello, you have a blank page or just some bugs like the cart in the bottom, things like that? If it is the second problem, it is just a cache issue, if it is the first problem, downgrade version, I work on it. Unfortunely, my site broke cause to the PHP version (5.3.3, and my host provider can’t update the server). I had to change my theme and set the web under maintenance. Anyway, i use this theme too in other projects with PHO 7.1 and it works fine. Good job! Thank you for this beautiful and awesome free theme and the efforts you make for it. Thanks to you, elementor team and wordpress teamI can create very efficient, nice looking and professional websites. At this moment my clients have no need for the pro addons yet, but if needed I will definitely purchase it from your site. Hello, did the update yesterday. Now comes in the footer of the cart. how can you switch it off? Hello, have cleared the cache. Nothing changed. The shopping cart is always displayed in the footer. Hi, many users had the same issue, it is a cache problme, I have checked your site, nothing wrong. You can check too if you use a different browser or in an incognito window. I use a chid theme so … what the problem ? Hello, sorry for that I fixed the issue, I will update the theme today. for now, i put the old version of this file ( woocommerce-config.php ) and all go well ..
What Can I do to update and continue with same codes? Hello, where have you added your Google Analytics code? If you have added it directly in OceanWP, it is normal that you lose it, you need to use a child theme. Hey Nicolas, thank you for this amazing theme. We are not using any WooCommerce but we still appreciate your dedication to this theme! We have one question: In a recent update it was added that the picture description is added on the blog page. Is there any way to deactivate this feature via css or something? We think it takes away from the whole experience. Currently we manually removed all the descriptions. For the picture description, you mean the caption? Well, that was easier than I thought. I thought that would remove the captions with in the posts itself as well. I become fan of OceanWP theme, is one of the most accomplished free theme. Such dedication and expertise is unbelievable. And besides this “French Touch” it’s worth more than anything. Keep it this way my friend. Hey Nicolas beautifull like always. I am using oceanwp and elementor and have problem that in Shop product categories are not displayed nice like in previous version. Where can be the problem? The product category was always like this. I didn’t change the style. Hmm, didnt quite understand that, because its giving me a hard time after update. Categories and subcategories in woocomerc side bar are showing strange and diferent. If it is possiblle i would send a screenshot. 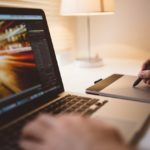 Is there place I can submit photos of two websites? One is previous version and categories and subcategories in shop page looks nice and one is new version and it looks prety strange. Sorry, I see nothing wrong, have you checked your site on an incognito window to be sure that is not a cache issue? Yes I call a friend to check on his browser and he also see the same problem. Website with old version giving clean look of categories in woocomerce sidebar but this one on new version since this morning is giving me this trouble. Can I provide you somwhere a picture? Did you checkout both websites that I provide? I answered your topic on the WordPress forum, you can send me screenshots from there. But as I said, I improved the product categories widget as you can see on the Shoes demo. Such a great and wonderful theme! Thank you very much, we just built this new site for our client with your great theme as the heart and soul! Nice work Nick! Great improvements, congratulations. My site is using OceanWP since a year ago and it is very clear, reliable and the end users likes. I have updated the theme version and the feature I like very much is the multi-step checkout, however I wonder where to translate the text in first step from English to Spanish. I am using Loco Translator Plugin but I can’t find the english texts. I don’t know well Loco Translator but the multi-step checkout words can be translated via the languages folder of OceanWP. j’ai un abonnement chez vous, comment puis-je télécharger la pro template shoes ? Bonjour, mettez à jour Ocean Pro Demos sur votre site, et vous aurez la nouvelle demo Shoes dans Theme Panel > Pro Demos. Ah c’est good merci ! Hello, you mean that the title is above the navigation? In your case, you will need to increase the container width or disable the navigation. Bonjour Nicolas, excellent work as always! I’m just having one small issue, which (1) does not appear to be a caching issue, as I’ve cleared both my client, server, and edge caches, and (2) is only happening on one of the many sites for which I use OceanWP. Namely, the Ajax toggle for Login/Register is not working at https://dubafit.com/my-account/ . I’ve tried regenerating the Woo CSS via the theme panel, but still no success. Do you have any advice or insight as what may be causing this issue for me? Hope you enjoyed my donation, keep up the great work Nicolas! Nicholas, I am having the same problem that Branko describes above. I have posted on the OceanWP FB Forum (https://www.facebook.com/groups/OceanWP/permalink/1661674263922053/) about this and also did a support ticket. The Category Widget is in fact working differently. In v1.4.12 it was working like an accordion menu and now with v1.5.4 it no longer works. After doing a Grep/Diff to check file differences, I noticed that the .open-this CSS and JS has been removed from several files within the assets/css/woo directory. Can you please take a look at this and readd this functionality. Nicholas! I wanted to support the project and could not!) how can I translate modest aid other than PayPal? Unfortunately, there is no other way than PayPal for donation. Hello, the Ajax work on the default Add To Cart button, if you use a plugin that changes the button and you see something wrong, you can disable the Ajax via the customizer. The problem is when ajax is enabled product variation not added to cart. can you look into this? Love Oceanwp. Was debating between Oceanwp or GP and Oceanwp all the way. I was wondering if this is a Woocommerce thing or an Oceanwp thing. When a customer checks out and log in, instead of going to the next tab (billing) it redirects the customer out of the checkout page. This can lead to a lost sale. Is there a way for the customer to stay on the same page (checkout) once they are logged in? Hello, on the multi-step checkout? Yes, on the multi-step checkout. I just tried, when I login, I’m redirected to the checkout page and it is the Billing section not the login section. It is not this behaviour on your site, open a support ticket, I will try to check what is wrong. Thanks for double checking. That helped a lot. I have resolved the issue and it turns out that it was a plugin (mini-orange two factor authentication) that was causing the issue. Hello Nicolas, i’m using a plugin called order delivery date pro by Tyche softwares. After the latest update if i want to change a chosen date on the checkout page my timeslots aren’t visible anymore. Tried some other themes to find the problem and those are working fine. Of course i don’t want to use another theme so i hope you can help. Hello, can you create a support ticket? I will ask you more information. Hello. LOVE the theme. However, I cannot get quick view to work on any other page than our main page, featured product listing. I cannot find the quick view edit info anywhere in the theme either! Any ideas what may be amiss? Hello, can you open a support ticket? I will need some information. Hello! OceanWp is a great theme. But I need your help: How do I delete the continue shopping button? Help!! Hello, can you open a support ticket and send me the page url where you need to delete this button? I have a similar issue. My “Continue Shopping” link redirects customers to our homepage, not to our shop or the last category they viewed, or some other logical place. I’d prefer to delete the “Continue Shopping” link altogether, but if I must keep it, can I have the option to change the behavior so customers are redirected back to the last viewed product category? Otherwise, I’m loving the theme! Very crisp and clear and exactly the look we were going for. Thank you! Hello Kacie, can you open a support ticket, please? I loved all the options mainly the Out of the screen filter, but I think you should have the option to add this screen filter only in the mobile and option in which the client can make multiple choices before the filter direct to the products, plus a button to close the filter. Thank you for the beautiful subject, we are happy. The off canvas is a sidebar so you can add widgets in it, there are plugins to create great filters, you can add them to this sidebar. I’m use Elementor + OceanWP. I need customize cart and checkout pages. Which way to do it? Hello, if it is simple things to do, create a support ticket and I will help you but if you want specific things, you will need to hire someone to do it. Hi Nicolas. Your theme is absolutely the best. I was just wondering how can I translate the text from those new functions. My website is in portuguese, but I can only get QUICK VIEW and SELECT OPTIONS (from the floating bar) as the button’s default texts and I can’t find an easy way to change that. Am I missing something? Thank you and keep up the great work! Hello, you will need to change the texts you want via the pot file inside the languages folder of the theme. Or you can also use filters, if you create a pre-purchase ticket, I will send you the code. Hi Nicolas thank you for OceanWP theme it totally rocks. On the Shipping Page the form disables / shrinks the Town / City Select text box after you select Country, Last and how can that be fixed. For your problem, can you open a support ticket, please? I try to enable off-canvas filter. Already enable it in the customize>woocommerce>Archive. However, in the widget area, it still asking me to enable the off-canvas filter. In the Shop page, the filter is empty. Please help. Where do I find the “Cart Display”-option. I can’tt find it under Customizer -> Woocommerce -> Menu Cart. Hi there! Great work with oceanwp! May I know if there is any pre-made templates ready to use? Thanks! Having to turn off product nav in woo pages as it displays hidden products that don’t show in search. That’s not good. Also, the product bar thing just sales something about making a selection, not add to cart? Hello, can you open a support ticket, please. Hello! I’m doing a page with elementor where a special category is shown, it will be a banner. The problem is that OceanWP does not have a shorcode to add the filter bar, and in the Woo-Products option, it is not possible to choose to appear … how can it be solved? Hello, I will work on this for a future release, but right now, it is not possible. Hello! thanks for the reply, I will be waiting for the update with eagerness! Is Floating bar in single product section customizable? I need to fix font size, make a vertical alignement for pice and quantity fields as well as for add to card button. If bar haight can be customized it’s great. I’m dummy in css configuration and rather prefer to use theme customizer. Hello, many things can be customized but some things need to be done via custom css. Very Nice! Just discovered this multi-step feature, and built right into OceanWP. How Nice!! Any easy way via a filter to cahnge “Shipping” to somethign else on that checkout page? Keep up the good work. We use only OceanWP and Elementor now.